In our propriety we welcome you in a independant stone cottage or 2 large rooms of character (b&b) in our provençal sheepfold house. 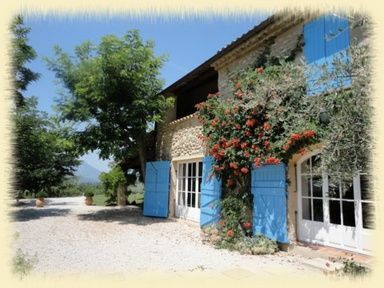 Provence : french holidays to "Le Jas des Sagnières", 1 gite or 2 Bed and Breakfast. Located in the Haute Provence Alps (Provence Alpes Côte d'Azur), PACA. If you love wide open spaces and Nature, you will be delighted with the landscape and the tranquillity of the Jas des Sagnières. A lovely countryside awaits you, it's the ideal place to take a break far from cars and pollution (it's 2 km from Sigoyer, a small village with 80 inhabitants and 15 km from Sisteron. The departement of the Haute Provence Alps is a haven of peace with a wonderful weather (from both Provence and the Alps), 300 sunny days a year and an invigorating mountain air. THE GITE : built in local stones (from the 19thC) and with an independent entrance, used to be an annex of the original sheepfold. It has been renovated for your comfort but it hasn't lost its old charm. The private terrass and garden are views on the mountain. The BED AND BREAKFAST ('Lou Pastre' and 'Lou Jas') are 2 charming rooms (with private bathrooms) in the owners'sheepfold. A other room, 'Lou Olivastre' (with private bathroom) is a small extra room rented only with one other room (small price). The breakfast is served all the morning in the covered dining-room or on the covered terrass. The covered terrace has a wonderful viewpoint from where you can admire the Alps and the Val de Durance.